Pet bloggers are a particularly dedicated breed of animal lovers. In addition to caring for the animals in their lives (and their human family and day jobs and other commitments), they take the time to share their experiences and knowledge, from training challenges and solutions to the joy of adoption and the heartbreak of loss. Their insights provide incredible resources for other pet parents, while their compassion helps us realize that we’re not alone in whatever we’re going through as animal lovers and caregivers. 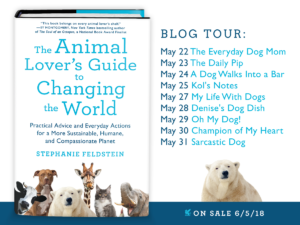 So, I’m honored and thrilled that a wonderful pack of dog bloggers is taking THE ANIMAL LOVER’S GUIDE TO CHANGING THE WORLD on a virtual book tour. Please join me on tour by visiting these blogs throughout the next two weeks and sharing their posts. There will be giveaways, so you’ll have lots of chances to get your paws on an advance copy of The Animal Lover’s Guide! The links below will be updated throughout the tour as the posts go live. Each of these sites is full of great information and adorable dogs. So don’t wait for the book tour to check them out.